We call it the big mix. Over 130 seasoned female executives and young professionals alike, hundreds of designer must-haves…and one great networking organization. Now that’s a great occasion for was a recent gathering at Tootsies West Ave for a “back to the basics” runway show demonstrating how to create a professional capsule wardrobe for careers in corporate, business casual, and creative environments in a fun and trendy way. The organization? 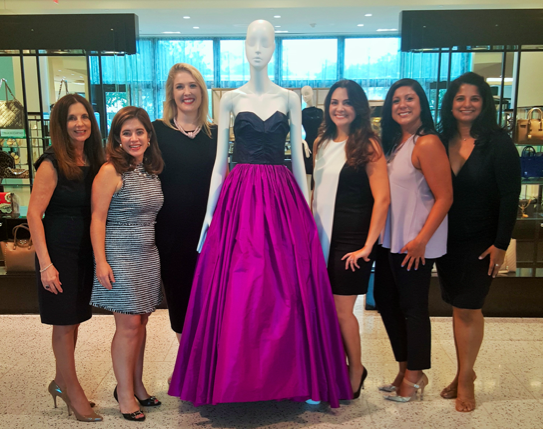 Ellevate, which is an international women’s networking group that launched in Houston in February 2015, is a global professional women’s network with over 34,000 members from across industries and around the world. The largest women’s network of its kind, Ellevate boasts a model driven by economic engagement of women worldwide by investing in women. Started as “85 Broads”, the organization was originally created as a networking space for women at Goldman Sachs, started in 1997 by the first woman ever promoted into sales management at the firm. Really, who doesn’t want to add more style to their professional marketplace? These like-minded women mingled in a fun and fashionable learning space over champagne, SlimRita’s, Nothing Bundt Cakes, and discussion of Diane Von Furstenburg, Hugo Boss, Nicole Miller and Theory looks to incorporate as tools to help ascend their careers in a more fashionable way. The event also featured Lidya K. Osadchey, CEO of ESCAPE Family Services, who spoke about the fulfillment that accompanies a meaningful career, while CEO Lucy Corona described what entrepreneurial life is really life through her experience founding and growing the SlimRitas brand of low calorie, all natural margaritas. To cap an already wonderful evening, Christy Sanantonio, group fitness manager of Equinox River Oak’s District, chose a lucky Ellevate gal to win a 6-month membership to the highly anticipated luxury club. Fitness, meets business meets fashion – we love that trio, don’t you? In the crowd was Shushana Castle, Lisa Pounds, Sharla and Chanel Stark, Amy Hertz, Shayna Andrews, Angela Lipsey, Neera Patidar, Angela Nichols, Claudia Sierra, Kim Padgett, Amber Elliott, and Ellevate Houston board members Mathilde Leary, Bianca Ferrer, Trinh Abrell, Jessica Zachary, Mariam Jacob, Jennifer Roosth and Luanne Jones.